Notwithstanding Quebec’s new fixed-date election law, Premier Pauline Marois of Quebec advised the Lieutenant Governor to dissolve the 40th Legislature on 5 March 2014, while the assembly was adjourned on recess and even though Marois’ single-party minority Parti Québécois government had not first lost the confidence of the assembly. Marois had floated the prospect of an early dissolution as early as September 2013, but she ultimately decided against a winter election. The Legislature of Quebec passed its fixed-date election law in 2013, though apparently no one had taken notice. Pauline Marois has thus built on Prime Minister Harper’s precedent from 2008, when despite the federal fixed-date election law, he advised the Governor General to dissolve the 39th Parliament while it was adjourned and while his single-party minority government still commanded the confidence of the Commons. In reality, neither Prime Minister Harper nor Premier Marois broke a law or a convention, because all the fixed-date election laws in Canada deliberately preserve the established constitutional positions of the First Minister and Governor via the non-derogation clauses. 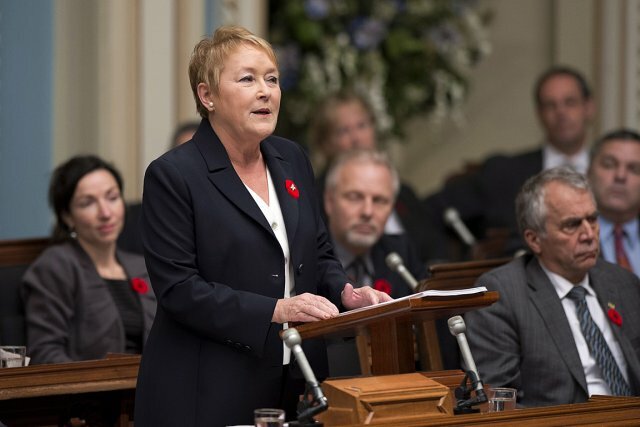 Premier Marois stated her intention to advise an early dissolution and an early general provincial election on 6 February 2014, as TVA Nouvelles reported. Just as Prime Minister Harper had concluded in August 2008 that his minority government was on the verge of losing control of the agenda in the House of Commons, and thereby the confidence of the Commons, Pauline Marois explained that she would not allow the opposition parties to obstruct her government’s bills and complained that the Liberals and the Coalition pour l’avenir du Quebec (CAQ) had decided to vote against her upcoming budget without even having read it. Marois also implied that both the Government and the Opposition must commit to making a minority parliament work, or else it should be dissolved. J’entends les commentaires de ceux qui disent : vous devriez respecter votre loi. Je suis d’accord. Mais ça ne peut pas se jouer seulement d’un côté de la chambre. Ça doit se jouer des deux côtés. Pour l’instant les oppositions nous disent : on aime pas d’avance votre budget, mais on ne sait pas ce qu’il y a dedans. On veut vous renverser sur le budget. Disons qu’on va jouer à armes égales. On 20 February 2014, the Liberals and CAQ used their combined majority in the National Assembly to pass a motion compelling Premier Marois and her husband Claude Blanchet, a wealthy businessman, to appear before the Parliamentary Commission on Public Finances. The commission is investigating political corruption and a questionable political donation of almost $3 millions from FTQ Construction to Blanchet’s business Capital BLF back in 2008. This motion is binding and compels the Premier to appear before the committee before 18 March 2014; if she were to refuse, she would place herself in contempt of parliament. According to the National Assembly’s calendar, this schedule recess would end on March 10th, which would give Marois at most 8 days to prepare for her appearance. However, Marois found a convenient method of ensuring that she will not risk being declared in contempt of parliament and that she does not have to appear before the committee: an early dissolution. An early election will also allow the Parti Québécois to take advantage of the virtual collapse of the CAQ’s support, present its proposed Charter of Quebec Values to the electorate for approval, and most likely win a parliamentary majority. Since Marois did not table a budget before the dissolution, the Government of Quebec might have to use Special Warrants in 2014, depending upon when the 41st Legislature is first summoned. Nous avons un plan et l’équipe pour réaliser ce plan. Malheureusement les libéraux et les caquistes n’ont plus qu’un but c’est de bloquer le gouvernement. As of March 2014, all the provincial legislatures, except Nova Scotia’s, and the Parliament of Canada have passed fixed-date election laws. Governments across the country have portrayed these laws as limiting the Prime Minister’s ability to advise an early dissolution and control the timing of the election for partisan gain. In reality, all of these fixed-date election laws have preserved the established constitutional positions of the First Minister and Governor by including a non-derogation clause saving the power of the Governor to dissolve the legislature; only a constitutional amendment under section 41(a) – the unanimity formula – could truly take away the executive’s control over dissolution, because this authority pertains to the “Office of the Queen, Governor General, or Lieutenant Governor of a Province.” These laws also do not conjure up a new constitutional convention that the First Minister would only advise an early dissolution under certain conditions, as Prime Minister Harper and Premier Marois have shown through their decisions, and as Premier Wynne has indicated in her statements from last fall. For instance, the British Fixed-Term Parliaments Act of 2011 has put the prerogative of dissolution in abeyance and transferred this authority to the House of Commons; the Queen no longer dissolves parliament on the advice of the Prime Minister. The British Parliament can only be dissolved earlier than the five-year limit if two-thirds of MPs approve a motion “That there be a dissolution of parliament and an early general election,” or to break the deadlock if a simple majority of MPs pass a motion of constructive non-confidence in the government but the alternative government fails to command the confidence of the Commons within 14 days. This model of true fixed-term parliaments also requires constructive non-confidence (which means that the Opposition could only withdraw its confidence from the Government if it also proposes an alternative government) and represents a radical departure from Westminster parliamentarism as we knew it. Thankfully, only a constitutional amendment could impose this radicalism of transferring the Crown’s executive authority over dissolution to the Commons and replacing the current confidence convention with constructive non-confidence on Canada. I oppose both of these efforts on principle. Responsible Government means that Ministers of the Crown take responsibility for all acts of the Crown, and therefore that the Governor acts on and, save for exceptional circumstances, in accordance with the advice of the First Minister or Cabinet. The Governors still possess the discretionary authority to reject advice to dissolve parliament and thus refuse fresh elections; however, a Governor can only justify his intervention into the executive government under exceptional circumstances precisely because of the exceptional consequence of his discretion. By refusing to act on the advice of the First Minister or Cabinet, the Governor dismisses them from office or forces them to resign, because a Ministry can only take responsibility for advice that it has offered, not for the contrary advice that it did not offer. In addition, the Governor can reject ministerial advice in this fashion if and only if he can then appoint a new First Minister who will take responsibility the dismissal or resignation of the outgoing Ministry. Some First Minister must always take responsibility for dissolution. Finally, refusing advice to dissolve is not the equivalent of dissolving unilaterally. Under our system, Governors do not and cannot undertake any executive act unilaterally because every proclamation, order-in-council, or other executive instrument requires the counter-signature of a responsible Minister of the Crown before the Governor can formally promulgate it. The proclamations of dissolution, the writs of election, and calling together the next parliament after the general election all require ministerial counter-signatures. In other words, if the Lieutenant Governor of Quebec rejected Premier Marois’ advice to dissolve the legislature, he would thereby revoke her official commission of authority to govern and either force her resignation or outright dismiss her from the Premiership. He would then have to commission an alternative government from within this 40th Legislature by calling upon Liberal Leader Philippe Couillard and CAQ Leader Francois Legault to form some kind of coalition government (since their parties combined form a majority) in order to take responsibility for Marois’ dismissal and command the confidence of the assembly. This was never really an option – particularly not in Quebec, where gubernatorial intervention would only make the sovereigntist cause more popular and provoke the Parti Québécois to call a third referendum! Will the media treat Harper and Marois equally? I doubt it. If this article in Tuesday’s edition of the Globe and Mail provides any indication, most of the English-language media probably don’t even know that Quebec also has a fixed-date election law – which fits into their pattern of ignoring Quebec entirely under most circumstances, except to stir up resentment against the Parti Québécois. However, even among the French-language media like Le Devoir, La Presse, TVA, and Radio-Canada, I could find only one article, from the state broadcaster, that devoted any attention to Quebec’s new law. As such, most media outlets would not even grasp the fact that Marois is doing in 2013 precisely what Harper did in 2008: advising early dissolution while the assembly is adjourned and while the single-party minority government still possesses the confidence of said assembly. When Premier Kathleen Wynne of Ontario – who also leads a single-party minority government – suggested in October 2013 that she would seek an early dissolution if her government lost control of the legislative assembly’s agenda, the media also responded apathetically and never mentioned Ontario’s fixed-date election law. Wynne would in fact be well within her rights to do so. While it is possible that the media have learned from Prime Minister Harper’s precedent of 2008 and accepted the fact that Canada’s fixed-date election laws do nothing at all, I can’t help but think that partisan considerations also play a role in the inconsistent coverage. Canada’s fixed-date election laws do not alter the established constitutional positions of the First Minister and Governor, so Harper, Marois, Wynne, and whatever other First Minister could always advise an early dissolution under any circumstances, just as before. I only ask that the media treat these First Ministers consistently, or at least clarify that since 2008, they’ve accepted the futility of the Canadian approach to fixed-date elections. But that’s probably too much to ask! This entry was posted in Crown (Powers and Office), Dissolution, Fixed-Date Elections, Governor's Discretion, Prime Minister's Powers, Reform. Bookmark the permalink. I have always opposed these Fixed-Date Election Laws since they first began, I believe, in British Columbia. It doesn’t do anything to improve the democratic process. We always had Elections every four years or so when there was a Majority Government with a chance of re-election. (One exception was Chretien / Martin calling Elections after 3-1/2 years. Big mistake in 2004 Paul!) When the Polls were bad, Governments historically delayed the inevitable Election till five years to the irritation of the Opposition as well as the populace. However, if the Government is popular it would better represent taxpayers by waiting till five years for the Election. These Fixed-Date Laws do not prevent surprise Elections since the Opposition Parties always knew when an Election was coming because the Government Party was nominating its Candidates! The British Fixed-Date Law is the fault of the Liberal Democratic Party of Britain’s coalition government with the Conservatives. Other than the LDP’s proposal for a Preferential Ballot, I don’t think there is any LDP policy I actually like. The British Law will cause future problems with Minority Governments. Our Joe Clark PC Minority Government and 1980 Election is an example of a future problem for the British Law. However, in Canada these Laws thankfully have no teeth, and so mean nothing. I understand what you mean about the Media not realizing how Marois breached her Election Law. In 2012 the PQ ran on a proposal to strip away the right to run for political office from everyone who doesn’t speak French! The dullard Media never realized that this was a modification of a Nazi Nuremberg Law against the Jews! That proposal says enough about the moral bankruptcy of those Separatist fascists! The silence from English Canada also revealed how overly-tolerant English Canadians have been of these fascists. It’s time for English Canada to put the Separatists in their place before they attempt to destroy our country. P. S. “Gubernatorial” is an American creation which I personally dislike for being improper English. “Governorial” would be the proper adjective in The Queen’s English, and I don’t understand why it doesn’t exist. Correct me if I’m wrong, but hasn’t every instance of a fixed election law being disregarded been in a minority government? Couldn’t a convention be forming establishing when the fixed election laws should be followed? i.e. In a majority situation, when the government holds the exclusive power to call an election, an early election should not be called; but in a minority situation, where the opposition can force an election at any moment, the law can be disregarded — because to do otherwise would give all the power to the opposition (since the government would have its hands tied if they were bound by the law).